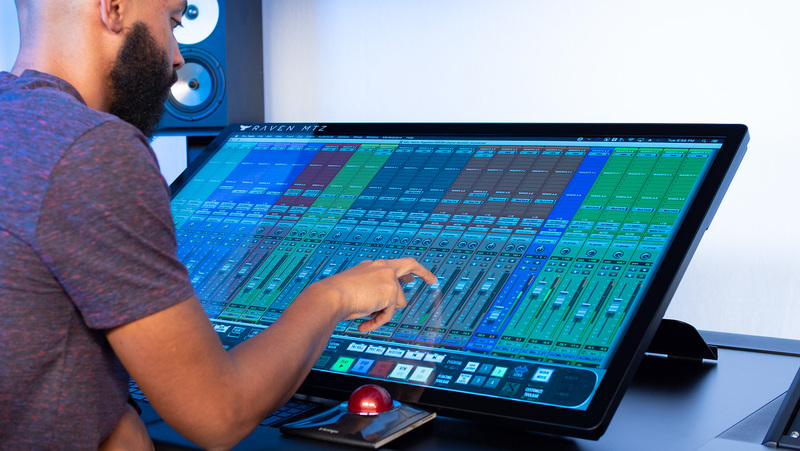 Over the past three decades, the entire recording studio ecosystem has shifted from a tactile analog environment to a virtual digital environment which rests upon a computer screen. 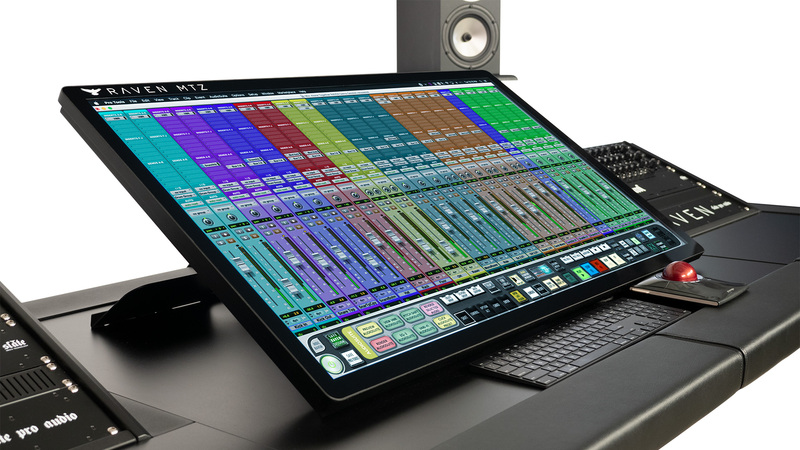 In 2012, Slate Media Technology realized that in order to get the most immersive studio workflow, no better solution existed than to turn the screen into a world-class control surface. 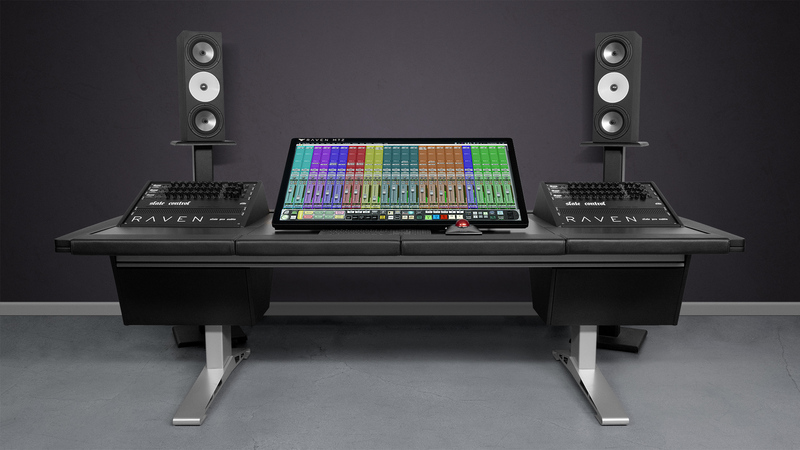 So we created the RAVEN, a multi-touch monitor that integrates seamlessly with digital audio workstation software. RAVENs are now found in top studios around the globe, including those of Snoop, Will.i.am, Steve Aoki, Mark Needham, Dolly Parton, and many more. The original large-format RAVEN, the MTX, had a price tag of $16,000. Now in 2019, we’re proud to announce the next evolution of the large format professional RAVEN Series, the RAVEN MTZ – available for order at just $2,999! The MTZ boasts a 43″ projective capacitance no-bezel panel with TEN ultra-accurate multi-touch points. With a depth of only 1.5″, the MTZ is sleek, ergonomic, and the ultimate solution for the modern professional studio. We are proud to announce that the first RAVEN MTZ will be installed in the world-famous NRG Recording Studios Mix Room C, where it will replace an older large-format analog console. The MTZ will have multiple desk options made by top manufacturers such as Zaor, Argosy, Sterling Modular, and more. 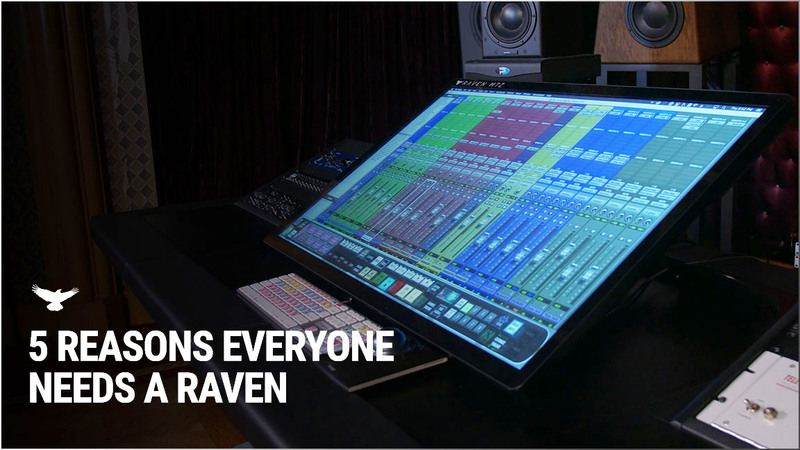 RAVEN 3.6 comes with customized multi-touch control of Ableton Live, Cubase/Nuendo, Digital Performer, Logic Pro X, Pro Tools 10-2019, and Studio One V4 on Mac, as well as Windows compatibility for Pro Tools 10-2019, Cubase 8-10 and Nuendo 7 & 8. RAVEN’s multi-touch faders allow the most precise control of your DAW faders. By integrating multi-touch 100mm virtual faders directly into each DAW, the engineer has seamless control over mix levels and automation. RAVEN faders have a virtual ‘feel’ that allows an intuitive action that is comfortable and even fun to use. For the most critical automation, FINE FADER mode can quadruple the resolution of the faders so you can get even the most minute moves down in the first pass with ease and perfection. As its name implies, GESTURES allows classic multi-touch gestures to control important elements of the DAW such as opening and closing plugins, muting and unmuting tracks, zooming in and out, and more! Dynamic Gestures now automatically detects the DAW and uses the correct gesture profile for the DAW, while automatically translating all the users key command to the open Application. Users can also set their own “default” gestures for the open application. Gesture profiles standardized across all DAWs. They even work for tasks outside your DAW! Slate Remote revolutionizes your workflow in ways you must experience to believe. Slate Remote is a free app for iOS users, available at the app store to anyone with a RAVEN. Slate Remote automatically synchronizes with your RAVEN session via wifi network and gives you access to your custom Batch Commands, allowing it to remotely perform time-saving tasks for you from the palm of your hand. The RAVEN Batch Command System is a true revolution in control. The Batch Command System is a series of preset and customizable buttons that can execute up to 1,000 key commands and mouse clicks automatically. With just one button, the Batch Command System allows you to create instant headphone sends, name tracks, put entire drum tracks on the grid, export stems, and so much more! The Batch Command System comes pre-programmed with 100 preset batch commands in every DAW we support, with layouts for Music, Mastering, Post Production and more. Record your own mouse click automation or program user commands with our QUICKLIST, which features hundreds of predefined DAW operations. Just touch and hold on a Batch Command button to edit, and you’ll have access to almost limitless possibilities. With the Batch Command system, you’ll get it all done faster and smarter. Slate Media Technology was founded in 2012 with a mission to create revolutionary hardware and software products for the professional media industry. Products include the award-winning RAVEN line of Multi-Touch Production Consoles, and the Batch Commander digital assistant software.